#1 DeWalt DWFP12658 Coil Roofing Nailer Review! Weighing in at a nifty 4.7lbs, the DeWALT DWFP12658 Coil Roofing Nailer is a great addition to your tool arsenal, and is designed to simply make your life easier. Not only is it affordable, it is a high quality power tool that is brought to you by one of the most esteemed and reliable names in the tooling industry. Unlike other similar products in its segment, the DWFP12658 nailgun is great for any roofing project, and for several applications including sheathing, siding, underlayment, fiber-glass shingles, roof felt, asphalt, insulating board and tar paper. This roofing nailer makes nailing easier thanks to the exclusion of the long conventional magazine seen on other similar products. In addition, it offers superior control and balance, and is backed by a highly durable and robust aluminum frame and cap. Designed for commercial use, the DWFP12658 DeWALT Roofing Nailer is aesthetically pleasing and boasts a compact footprint, making it portable, easy to handle and powerful enough to work as fast as you do. The DWFP12658 roofing nailer is one of the most versatile tools in the market, and is designed exclusively for commercial use. Its robust aluminum frame is supported by wear guards and skid resistant pads for superior protection as well as tool safety. It is outfitted with a tool-free selectable trigger which allows seamless switching between the sequential mode and contact bump. Adding to this, the DeWALT DWFP12658 Nailer supports nail sizes between 3/4 inch to 1-3/4 inch, and its nail magazine can accommodate 120 – 15 degree wire coiled nails at any given time. 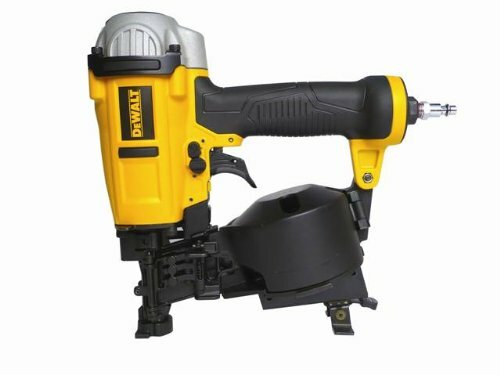 The DWFP12658 nailer is not only visually appealing, it provides superior comfort during use, thanks to the textured hand grip that runs all the way down to cover the base of the handle. Adding to this, the over-molded slip design of the grip offers unmatched slip resistance so you experience optimum comfort during use. One of the noteworthy features of the DWFP12658 roofing nailer is that it is fitted with a 1/4 inch air inlet NPT plug complete with a connect coupler, simply meaning that you enjoy unrestricted air flow when connected with an air source. The adjustable depth of drive mechanism of the DeWALT DWFP12658 coil roofing nailer is a handy feature, especially if you’re working with other roofers and sharing the same compressor. With this feature, you are able to adjust the depth of drive on each individual nailer with the flick of a switch. The shape and size of the trigger is a design element that’s often overlooked by other roofing nailer manufacturers, but the DWFP12658 roofing nailer outweighs its competition in this regard. It is fitted with a comfortable and curved shaped trigger which is wide, smooth and big enough to accommodate both fingers. With regards to the drivers of the DWFP12658 DeWALT roofing nail gun, they are asymmetrical in shape, which doesn’t cause the head to curl up and nail to cut into the shingle above. At the bottom of the DeWALT nailer is a shingle gauge, which can be configured to match the exposure of the shingle in order to figure out the edge of the next course up – a feature that is particularly handy when installing three-tab shingles. The DeWALT nail gun offers great maneuverability and three different ways to shoot, making it a solid tool for any roofing application. The DWFP12658 DeWALT nailer is appointed with a selectable trigger, which allows you to select between single sequential action and bump action mode. There is also a handy trigger lock button to ensure the trigger is locked when not in use. When the tool arrives, the default setting is single sequential action trigger mode, and the instructions to switch to another mode are explained in the owner’s manual. It comes equipped with a 1/4″ (6.4 mm) male quick connector coupling, but you can buy an optional 3/8″ (9.5 mm) coupling in case a 1/4″ (6.4 mm) air supply line is unavailable. Installing the air fitting is simply a matter of wrapping the male tip of the fitting with thread seal tape to eliminate air leaks, and connecting the adapter into the air inlet. Use DeWALT pneumatic tool oil or non-detergent and not detergent oil or additives, which will cause damage to the rubber parts and O-Rings. The DeWALT DWFP12658 nail gun is arguably one of the best tools for novice as well as seasoned roofers and hence there are not many cons to list. The only pitfall is that the opening to load the nails is small and located at the bottom of the DeWALT DWFP12658 nailer so you have to lift the tool up to eye level in order to check the amount of nails in the magazine. If you’re in the market for new coil roofing nailer, the DeWALT DWFP12658 nailer is definitely worth considering for several reasons. It is an upgrade to the D51321 DeWALT roofing nailer, is feature rich and comes without the cumbersome long nail magazine, making it much easier and efficient to use and perfectly suited for sheathing, underlayment, siding and other roof related tasks. The DeWALT DWFP12658 nail gun offers unmatched versatility, where it can be adjusted to eliminate the need to switch triggers. The wheel located at the right of the trigger can be used to control the depth of shot, and the nose of the DWFP12658 roof nailing tool opens up easily so that you can access and remove the jammed nails. Even the included shingle guide is adjustable, and the rubber grip extends all the way to the tip of the nailgun, making it extremely comfortable to use and prevents it from slipping from the roof. The only flaw in the design of the DeWALT DWFP12658 nailer is the fact that you have to lift the nailer to eye level to check the amount of nails left, which is really not too much to be fussy about. There are several coil roof nailers available in the market, but the DeWALT DWFP12658 Coil Roofing Nailer is appointed with all the necessary features to tackle any roofing project at the right price.